For my sisters to see. 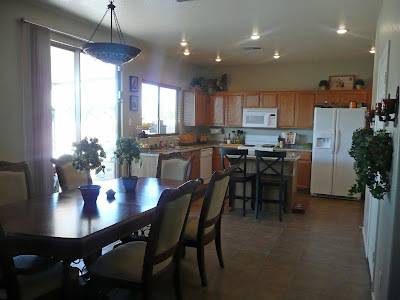 Here is the kitchen: Here is the Dining Room/Kitchen View 1: The sliding glass door leads to the back yard. The whole downstairs has the brown ceramic tile which I love. Except for my office space which has carpet. 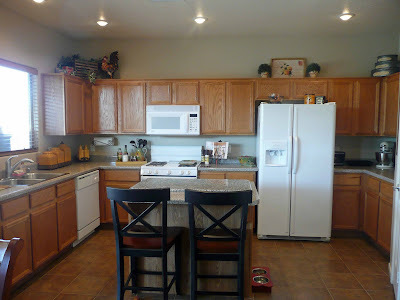 Here is Dining Room/Kitchen View 2: The white door leads into the laundry room which also leads to the garage. I really like that I have a laundry room instead of a closet and that the garage leads right into the kitchen for a change. The far door on the right is my walk in pantry, which I love also. Behind the dining room is the living room. It's like one big long room. I am not done with it yet so you will have to wait for pics on that. I have to get a area rug and a couple of lamps and then I can take the pics. Terry also put up the shelves in my studio space so I will be working on my room tonight and tomorrow. Stay tuned for more pics! I am loving this house! Who knows, maybe we will buy it! It's lovely, Cindy....you must be so, so glad to finally have the move behind you. Now the fun of arranging and decorating. Good job!!! 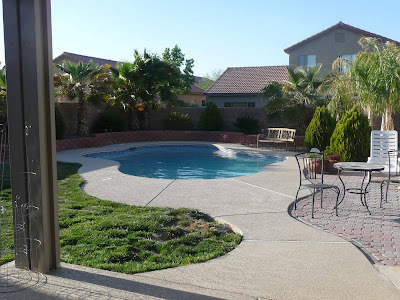 that back yard and pool are just to die for...and with the temps in Las Vegas, I am sure it will be well used. 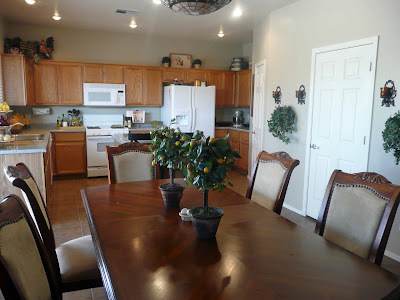 Love the kitchen and dining room and all the access to outside - beautiful!!!!! It is beautiful! I am so jealous of all your cabinets!! The back yard is gorgeous. It is beautiful Cindy! So much space!